Behind every great nation or institution is one or more men of strong CHARACTER. Here are vital "keys" found in these men of character — keys that will make possible SUCCESS and LEADERSHIP for those that possess and use them! COUNTLESS men of ability, intelligence, personality and training have failed to achieve success. Time, chance, circumstance, and "bad breaks" are often assumed to be the cause. But they are not the real answers. The heart of the problem is LACK OF CHARACTER! You have heard of the rising young executive who begins hitting the bottle and completely shatters a promising business career almost in its infancy. You've heard about the "happy" family and civic leader who suddenly loses everything through a clandestine affair with a woman young enough to be his own daughter. And the junior executive who suddenly jumps the tracks, begins embezzling company or bank funds, gets caught and ends up in OBLIVION or perhaps a suicide. These human tragedies failed to keep their eyes on the goal. Any intelligent, thinking person wants to be a SUCCESS — perhaps a leader in his chosen field. Yet most people have not known how. Perhaps you were taught that, when it comes to religion, you sort of get your mind out of gear, think sentimental thoughts and hope to "get saved" through some emotional experience and "roll around heaven all day." Maybe you were taught that there is nothing to do. Nothing to accomplish, nowhere else to go except sit around in heaven, listen to harp music and perhaps gaze on the face of the Lord. The God of your Bible says true Christians are training to be LEADERS in the World Tomorrow! We are training to help RULE this earth with and under Jesus Christ and to help straighten things out! Jesus said to His apostles: "I appoint unto you a kingdom, as my father bath appointed unto me; that ye may... sit on thrones judging [RULING] the twelve tribes of Israel" (Luke 22:29-30). In the little-understood parable of the pounds, Jesus showed that those who "overcome" the most — using his strengths and abilities and yielding them to God — will be given RULERSHIP. For God will tell him: "Well, thou good servant: because thou hast been faithful in a very little, have thou authority over ten cities" (Luke 19:17). The other man who grew and developed spiritually and used his physical talents as well in the right way was given authority over five cities since he did overcome only half as much. The man who "overcomes," who disciplines himself and develops character, is the one whom God will use as an instrument under Christ to help rule the earth in the world tomorrow. God can always add mental ability and strength. But character cannot be manufactured or artificially produced — it is something we must willingly develop now as free moral agents under God. Here, then, are SEVEN KEYS to building the character of the kind of RULER God will bless and use — the character of a KING. Remember King Farouk? He was the ruler of Egypt a few years ago. He had ability and personality — but very little character. He began a wild spree through the nightclubs of Europe and the Middle East. He overindulged. He let things go at home — indulging his "court favorites" with certain lavish gifts and opportunities but misusing the resources of the nation in so doing. The people had liked his personality and ability. But not the lack of character. Farouk was overthrown in a familiar Middle Eastern "coup." An interim government came into power — evolving into the present Egyptian Government under Gamal Abdel Nasser. A current example is the deposing of Premier Sukarno in Indonesia. Although working hard and fighting valiantly in the revolution just after the second World War, Sukarno soon went soft and began the familiar merry-go-round of wine, women and song. His indulgences blinded his eyes to many realities of political life. And now he, too, has been overthrown — the government currently in the hands of General Suharto of the armed forces. Both of these fallen rulers were noted for their swagger and vanity when they were in power. They preened and strutted. They lacked real humility, or any fear of the true God of the Bible! To have a lasting and prosperous reign, any king, ruler or leader MUST learn the lesson of humility. Your Bible says: "When pride cometh, then cometh shame" (Prov. 11:2). Again, "Pride goeth before destruction, and a haughty spirit before a fall" (Prov. 16:18). By contrast, God's Word says: "The fear of the Lord is the beginning of WISDOM" (Prov. 9:10). A man who comes to have a deep awe and respect for his Creator is just "beginning" to acquire the basis for real wise and understanding decisions. For he will be basing all of his plans and programs on the ultimate REALITY! This entire mixed-up world is soon going to learn that lesson! To know the true GOD of Creation, the God of the Bible, is the basis for all right thinking and judgment. It will help keep you properly HUMBLE. It will make you realize that you are just a little ant on a ball out in space we call the earth. You will quit playing "God" and wake up to reality. Jesus Christ said: "Whosoever shall exalt himself shall be abased; and he that shall humble himself shall be exalted" (Matt. 23:12). Jesus showed that one who surrenders his will to God, who humbles the self and thinks only of being a servant of God and fellowman — that man will be blessed, used as an instrument in the hands of his Creator, and empowered ultimately with eternal life and a spirit body. This is getting into deep water, perhaps, for some of you new readers. But if you would like to follow through on this, write immediately for our free and challenging booklet, Why Were You Born? The apostle Paul wrote: "Let this mind be in you, which was also in Christ Jesus: who being in the form of God, thought it not robbery to be equal with God: but made himself of no reputation, [or, 'emptied himself'], and took upon himself the form of a servant, and was made in the likeness of men" (Phil. 2:5-7). Too few understand this tremendous example of the willingness of Jesus Christ to "empty himself" of His divine power and glory in order to die for humanity. Very soon now, ALL THE EARTH will come to grasp and understand that because of this willingness to GIVE of Himself — to HUMBLE Himself — Jesus has qualified not only as our High Priest but as the KING OF KINGS and RULER over all nations! This is the very basis of the character the true GOD demands of every leader and king! Even in this present man-made society, this living spiritual principle operates. Those who yield to excess pride and vanity soon "fall" into utter oblivion and disgrace. Those who resist the temptation come out on top. Several years ago, McCall's magazine ran a very interesting and very important article showing WHY American prisoners of war in the Korean War often became "turncoats." Many turned against their own fellow prisoners or just "gave up" and died through lack of the will to live. It was an article which went to the very ROOT CORE of American society and its foundations. This article brought out the fact that the Army Intelligence, in reviewing these cases, pointed up the vital necessity of CHARACTER TRAINING in the home and in the school. A high army official stated: "Because of this the army would like to see every American parent, teacher and clergyman work to give our children... a firm regard for RIGHT and an abiding distaste for WRONG." He continued: "By the time a young man enters the army he should possess a set of sound moral values and the strength of CHARACTER to live by them" (emphasis ours). But what constitutes "right"? What do we mean by "wrong"? The answers to these questions present a gigantic PROBLEM to American society — indeed to all the world! Modern, "progressive" educators, psychologists and even clergymen say there are no absolute values. They teach that all truth is relative, that God may, in fad, be "dead"! Even the Communists can sense our lack of spiritual principles and dedication to a common ideal! Notice this startling revelation from the Red Chinese Chief of Intelligence regarding Americans captured during the Korean War: "The American soldier has weak loyalty to his family, his community, his country, his religion and to his fellow soldier. His concepts of right and wrong are HAZY. Opportunism is easy for him. He himself feels frightened and INSECURE... He fails to appreciate the meaning of, and the necessity for, any form of DISCIPLINE." Although this comes from Godless Communists, are we willing to stare this looking glass right in the face and ADMIT the truth about our materialistic, confused Western society? Don't kid yourself! It is not just the American soldier, but nearly every man in the street in America, in Britain, in this whole Western world, whose concepts of right and wrong are "hazy"! Hazy concepts are virtually no concepts at all! They leave the door wide open for lust and lawlessness. God says: "There is a way which seemeth right unto a man, but the end thereof are the ways of DEATH" (Prov. 14:12). Yes, the way that "seems" right to human reason usually leads man to his own destruction. Men need to learn that there is a Great GOD who sets the standard of right and wrong. He has not left it up to us to decide what the right way is, but only WHETHER we will obey His laws and ways! God does NOT say: "Worship God according to the dictates of your conscience." Or, "Worship in the church of your choice." Or, "Do the best you can and it will all work out somehow." Yet supposedly educated people in our society have accepted these vague, irrational, unreasonable, contradictory platitudes! What is God's way, God's character, God's love? "For this is the love of God, that we KEEP HIS COMMANDMENTS: and his commandments are not grievous" (I John 5:3). From Genesis to Revelation we find that God's LAW — summarized in the Ten Commandments — is the WAY OF LIFE. He ordained the Law for man's own good, to guide him in developing the very nature and CHARACTER Of God. If all men had this kind of character, there would be no wars, no murders, no robberies, no lies, no disobedience to parents, no vanity and lust — virtually NO UNHAPPINESS! For a full explanation of this tremendous spiritual principle, write for our extremely challenging and informative free booklet, The Ten Commandments. God's definition of "right" is keeping His Commandments. But what do we mean by "wrong"? What is "sin"? The specific Bible definition of sin — with which all other Scriptures plainly agree — is found in I John 3:4: "Whosoever committeth sin transgresseth also the law: for sin is the TRANSGRESSION OF THE LAW." We see that righteousness is KEEPING God's Law as summarized in the Ten Commandments. "Wrong" or sin IS BREAKING that same eternal, moving, inexorable spiritual Law! True character is based on obedience to the broad spiritual principles of God's Law. Here, in general terms, is a good basic definition of true character — "True character involves the capacity and willingness to find what is right, the will to choose the right way, then the strength of will to resist all other actions and impulses and DO what is right." Learn GOD'S standard of right and wrong. Live by it. Then you will be fit to rule and LEAD in your own family, your business and chosen profession — and you will certainly have a vital part in the government of Almighty God in The World Tomorrow! Any king or leader of men will be watched by his followers as to his complete fairness and impartiality in judgment. Nothing can harm morale more than the discovery that a leader is hypocritically accepting bribes, playing favorites or resorting to some other similar stratagem. True wisdom — pointed out in a previous article in this series — is perhaps the most important single policy of a great leader. Such a man will constantly have to be making decisions — and that calls for wisdom. God says; "Where no counsel is, the people fall: but in the multitude of counselors there is safety" (Prov. 11:14). Most people don't really want "counsel." They want their own way! However, a real leader of men must learn to exercise the character to seek and accept wise counsel in any important matter. And he must be completely fair and impartial in the decision or action he may take. "These things also belong to the wise. It is not good to have respect of persons in judgment" (Prov. 24:23). 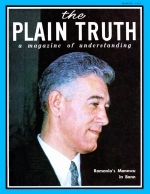 In the second volume of his autobiography, The Public Years, Bernard Baruch states: "But even when we discover basic truths about human affairs, it is another thing to overcome human failings — the greed, hatred, sloth, or whatever it is that keeps us from acting on those truths. In a laboratory, men follow truth wherever it may lead. In human relations, men have a supreme talent for ignoring truth, and denying facts they do not like." So in your own life, your family and your business, learn to be impartial and fair. Learn to get ALL the facts. Learn to get wise counsel. Learn to admit your own mistakes. Then act on the TRUTH with fairness and mercy! A real "leader" is one who LEADS. You cannot just "hand" a man authority and expect him to lead and dominate over others automatically. He must have built into his character the strength, the leadership and determination to properly direct others and command their respect. Many times, he may have to make hard and unpleasant decisions. But make them he must. And he must see that they are carried out. A great leader must have the strength of will to DOMINATE in any crucial situation to guide the affairs of his family, company, institution or nation in the right way. An outstanding example of this is recorded in the book, Churchill, by Lord Moran. Lord Moran writes of Sir Winston Churchill: "What his critics are apt to forget is that you cannot measure inspiration. That is why it is not easy to bring home to the military hierarchy the list of assets which easily tilt the balance in his favor: The strength of will that has bent all manner of men to his purpose; the extraordinary tenacity — the Americans call obstinacy — with which he clings for months and if need be for years, to HIS own plans; the TERRIFIC FORCE OF PERSONALITY that can brush aside all doubts and hesitations, and sweep away inertia, refusing to listen when weaker men begin to whine about difficulties; above all else, the superb confidence he exuded in 1940" (emphasis ours). This "terrific force of personality" and the strength of will exerted by Churchill was undoubtedly a major factor in literally saving Western civilization only a few short years ago! Disdaining his own doubts, fears and hesitations, every truly great leader must exercise this type of character! Any man who deals with the lives and fortunes of others needs a great deal of patience. For everyone has human nature, and each of us must be patient with the other. We must also be merciful. Even the so-called "Lord's prayer" records this important principle: "For if you forgive men their trespasses, your heavenly Father will also forgive you: but if you forgive not men their trespasses, neither will your Father forgive your trespasses" (Matt. 6:14-15). God's Word instructs us: "He tha4 oppresseth the poor reproacheth Maker: but he that honoreth him hath mercy on the poor" (Prov. 14:31). Again: "He that followeth after righteousness and mercy findeth life, righteousness, and honor" (Prov. 21:21). A man with a "big heart," a man who is big enough to forgive and for get, to care for and help the downtrodden this type of leader inspires deep and lasting loyalty in those who serve him. A recent book brings out that George Washington, Father of the American Republic, exemplified this trait in many ways. During the Revolutionary War he encountered a number of British Redcoats defending themselves fiercely, and he cried: "See how those noble fellows fight!" But after the battle, he found a wounded British soldier being set upon and robbed by American stragglers. Furious, Washington drove the thugs away and ordered a soldier to stand guard over the bleeding Redcoat until he could be moved to camp. Later, as President, he was often visited by former comrades-in-arms, old soldiers having a hard time. Though constantly plagued by a shortage of cash, Washington always gave each soldier a warm reception and there was a standing order in the kitchen that each veteran was to be served a good meal and sent away with a few dollars. Any great leader must develop this capacity for understanding, for mercy, and for forgiving the minor faults and irritations of others. "For he shall have judgment without mercy, that hath showed no mercy; and mercy rejoiceth against judgment" (James 2:13). Once the nation begins to flourish or the business begins to prosper, it is all too easy for the man at the helm to let down, begin to "take it easy," and give way to human lust and vices. A great leader must so discipline himself that this NEVER happens! God says: "The hand of the diligent shall bear rule: but the slothful shall be under tribute" (Prov. 12:24). The man who works hard and produces — this man is going to end up "in charge." But the man who lets down and is lazy will soon find his job taken by others. Again, "He that is slow to anger is better than the mighty; and he that RULETH his spirit than he that taketh a city" (Prov. 16:32). For the sake of his position — and as an example to his followers — a true leader must learn to discipline himself in what he eats and drinks, how much time he spends away from the job in recreational activities, the kind of companionship he keeps, the kind of spiritual character he is and portrays to others. Nearly every great nation or institution is merely the length and shadow of one man. People follow their leaders! If a king is a drunken woman-chaser, so will his subjects be. If the head of a company or family is irresponsible, lazy and given to personal indulgence, so will be his employees and his family! We see all around us today the so-called "new freedom" — freedom to BREAK God's Laws, to DESPISE all human law and constituted authority, to "get something for nothing," to justify sexual promiscuity, lying and cheating and even homosexuality. Bernard Baruch — famous "counselor of presidents" — sums up a supreme lesson all of us in this modern world desperately need to learn: "This is the test of SELF-DISCIPLINE. Even when we know what is right, too often we fail to act... we blame the nation's troubles on others... But it is far more likely that we will find the source of our national trials in our own failure as individuals to DISCIPLINE OURSELVES to do what the nation's well-being demands" (emphasis ours). Through God's help, learn to MASTER yourself — your own selfishness, lust and vanity. Self-mastery comes first — the opportunity to lead and direct others follows as a result. Finally, the sincere feeling of outgoing concern, compassion and LOVE for others is an absolute must in the character of anyone who would be a real leader or king. Jesus Christ said: "By this shall all men know that ye are my disciples, if you have LOVE one to another" (John 13:35). His entire life and ministry was a continual example of love and service. In the end, He GAVE His very life to redeem human beings to their God. Throughout history and throughout life, the lesson is indelibly written that a man who does not have sincere love for others will never command their deep loyalty, respect and obedience. They may be cowered into fear, goaded on through greed and avarice in anticipation of the spoils, but when the going gets rough it is LOVE which truly binds together the right kind of family, the true Church of God, the right kind of nation or people. Coupled with humility and the fear of God, guided by GOD'S standard of right and wrong, inspired by wise and impartial judgment, empowered by strength and determination, tempered by patience and mercy, protected by diligence and self-discipline, this outgoing LOVE will lead any father and head of his family, any company president, any team captain, any national leader to GIVE and SERVE unselfishly those who share with him in the common task, trials and blessings. If you would truly build GOD'S kind of character, then ask, seek, cry out and then yield yourself to EXERCISE this kind of love in your life and in your relations with others and with Almighty God! There is NOTHING more important. For this kind of love is far from a religious platitude. It is a living, abiding, moving, active spiritual principle which is as real as tomorrow, as active as the law of gravity, as eternal as God Himself. To be a leader, a servant of your fellowman, and a KING in The World Tomorrow, think on and LIVE by these things.